There are some appetizers I almost always serve if I’m hosting a winter party. Spinach-Artichoke Dip. Bacon-Wrapped Dates. A nice cheddar with some fancy crackers. Sometimes I make a spiced nut mix. But I love to try new recipes to add to the mix, and I’ve recently found one that gives mozzarella a distinctly wintery taste. 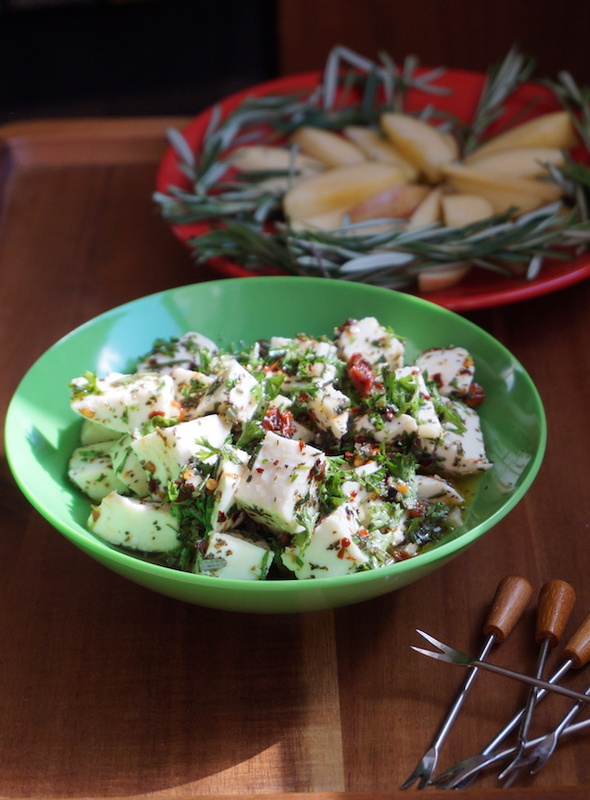 This marinated mozzarella even looks like Christmas, with touches of bright red sun-dried tomatoes and flecks of crushed red pepper combined with Christmas-tree-green rosemary and parsley. It’s an eye-catching color-combo that will have you reaching for a toothpick and taking a bite before you’ve even realized it, a reflex response to such inviting fare. With all that goes into hosting a holiday party, it’s a relief to find simple recipes you can make ahead, especially if they are packed with flavor and look impressive. This recipe comes together in about 10 minutes, and then you just chill it for at least half an hour. 10 minutes prep time, 30 minutes marinating time. Combine all ingredients except cheese. Mix together. 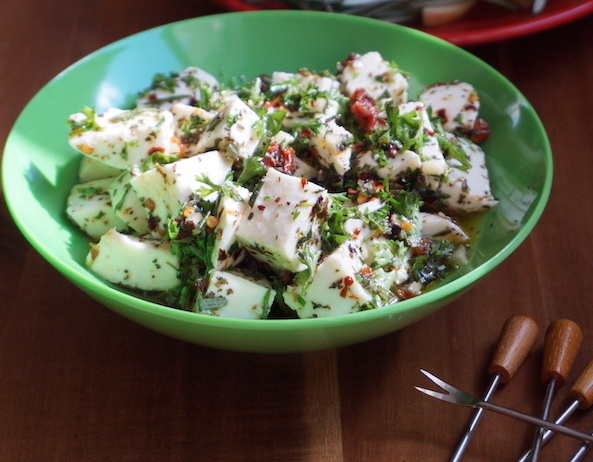 Add Conebella Farm fresh mozzarella cubes and stir to mix, making sure cheese is well covered with oil and spices. Cover and refrigerate at least half an hour. Remove rosemary sprig if desired. The goal is to infuse the marinade with rosemary flavor (fresh rosemary is fairly hard, not a texture that works well in this particular recipe). ← Bring this Quinoa Harvest Salad to Your Next Gathering!